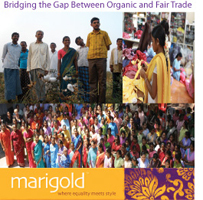 marigold clothing sale and documentary showing! Join us for an afternoon of fair trade treats, music and a documentary about the organic farmers and co-op of over 300 women we work with. We will also have an unveiling of our new summer clothing and housewares!! 12-4 Marigold’s 2010 line of dresses, skirts, tops, jackets and housewares will be on display for purchase with chai and refreshments served all afternoon! Music by Diane Sonntag and JL throughout (from Gaelica). Entry filed under: Sales and Promotions.